Venomoid snakes - photos of operation/s. The original paper had numerous photos and detailed captions. Not all are reproduced here (below) due to server space limitations. However for the benefit of persons accessing the internet produced below are a series of photos of an operation on an Adult Male Eastern Brown Snake which recovered and ate within days and remains in immaculate condition and is used routinely for venomous snake shows, including events such as the (early 2004 events including) Foster Show, Pakenham Show, Red Hill Show, Melton Arts Festival, Bayside Festival, etc. 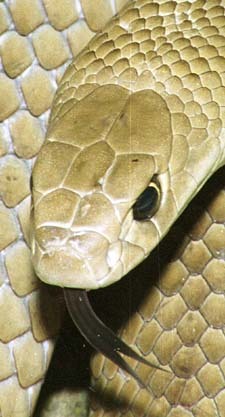 The same applies to the adult female Tiger Snake depicted in the photo below (and all other snakes operated on by the author). Both specimens were depicted in the same images in the original venomoid paper as were other snakes. Other species operated on include Death Adders (Acanthophis), Copperheads (Austrelaps) and Red-bellied Blacks (Pseudechis), all of whom recovered from surgery without incident. A further paper detailing the procedure of operation on the Death Adders and further refinements to the surgical process is in press as of April 2004. (A later (mid 2004) series of six operations (in succession) on 1 Female Death Adder (A. antarcticus), 2 Male Northern Hill Death Adders (A. bottomi), a female Tiger Snake and a pair of male newborn Collett's Snakes (P. colletti) were uneventful in that all the snakes were given food and ate three days post operation and their appearances and natures were effectively unchanged by the operation). All snakes are routinely used for live shows/displays and frequently handled. 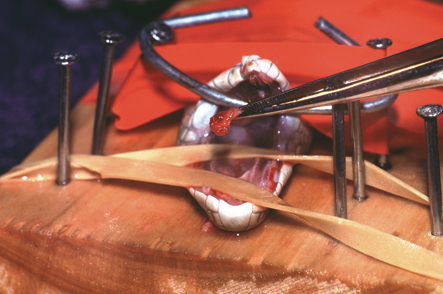 Above: Eastern Brown SnakePseudonaja textilis near end of venom gland removal operation. 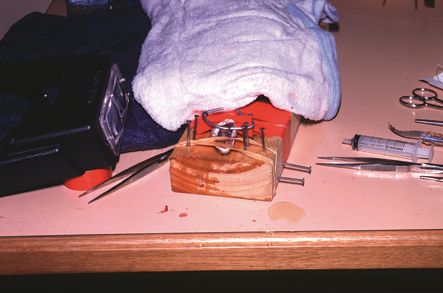 The means of restraint and fixing of the snake (shown here) is preferred to that used for the Tiger Snake (last photo on this webpage), although both variants worked without problem. Note how in this photo, the rubber bands hold down the upper jaw (bottom) to the wood and the hard wire frame does the same for the lower jaw (top). The tape wrapped around snake and board, prevents the snake from moving. 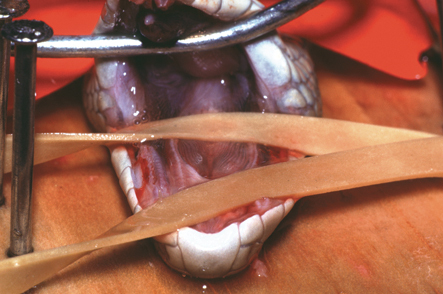 Above: Eastern Brown SnakePseudonaja textilis near end of venom gland removal operation. Holding one removed vemom gland in tweezers. It is the posterior end of the gland and some attached muscle tissue showing. Note the lack of bleeding resulting from this operation. 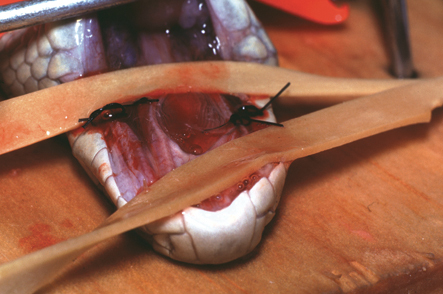 Above: Eastern Brown SnakePseudonaja textilis near end of venom gland removal operation. Both venom glands are now removed. Note the elongate wounds present where the venom glands were. The wounds appear small and narrow in this species because the venom glands are situated relatively high in the head and somewhat away from the mouth, being separated by a sheath of muscle. Above: Eastern Brown SnakePseudonaja textilis near end of venom gland removal operation. Both venom glands are now removed and one side is sutured up. The internal mouth wounds heal quickly. The pin prick holes in the labial scales, through which the sutures run take longest to heal. 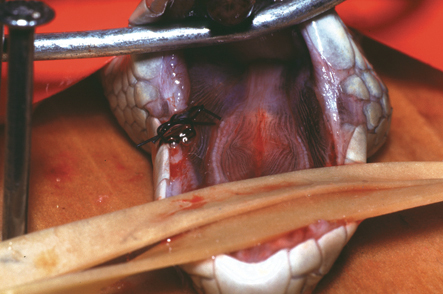 Above: Eastern Brown SnakePseudonaja textilis near end of venom gland removal operation. Both venom glands are now removed and both sides are sutured up. From here Betadine (Povidine iodine) is liberally applied to the mouth, the snake is measured and skin worms (if any) are cut out. The snake is untied from the operating plank, by cutting the tape and carefully separating it from the skin. This is done posterior first. The snake is then placed into a cage and left alone to recover. Sutures are removed 7-14 days later and at that time only, Betadine is reapplied. No other treatment is needed to affect a full recovery. Above: The Same Eastern Brown SnakePseudonaja textilis as depicted in the photos above. This photo was taken about 7 months post operation and includes at the immediate end of three months of "Hibernation" in which the snake was cooled (not fed) and used about 3 times a week for live reptile shows. The recovery was complete and venomoid state totally undetectable. Of bigger health concern for the snake was the showing of the snake (for educational shows), which naturally burns energy at a time the snake was not being fed (hence more rapid loss of condition than would otherwise occur). However as the snake had lots of condition before being cooled (more than normal), even this was a non-issue. Also take a close look at the labial scales. There is now no evidence of suture marks (pin holes), the last part of the snake to recover (and see the earlier photos with the sutures running through these scales). The labials are totally normal and the snake thinks it is totally normal as well. It just has no venom! NOTE: This photo was NOT produced in the original paper (as the photo was taken on August 18, 2004). In late 2005 (Oct/Nov), this snake successfully mated with a female of the same species (see two photos below), the female producing fertile eggs on 23 and 24 December 2005 that hatched on 29 Jan 2006, being Australia's first successful breeding of venomoid snakes. Note: The male and female depicted are actually the same colour. However in the photo the female is about a fortnight pre-slough and hence appears much darker. This is normal for the species. Below: World First!!! 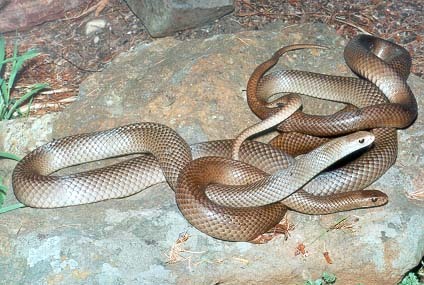 Successful breeding of venomoid Eastern Brown Snakes (Pseudonaja textilis). Unfortunately the hatchlings depicted were still venomous. 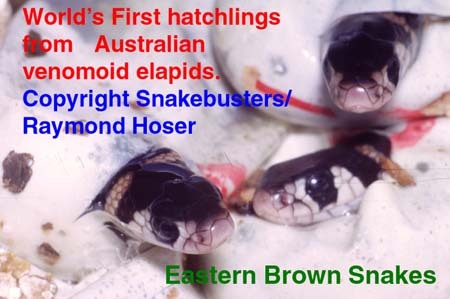 See the 2006 paper on breeding Eastern Brown Snakes on the web at: http://www.smuggled.com/EasBro1.htm by Raymond Hoser, for the details of this significant event. Above: Female Eastern Tiger SnakeNotechis scutatus near end of venom gland removal operation. One venom gland has been removed as seen by the gaping hole to the right. The other venom gland has been partly removed, having been severed from the posterior muscle ball. 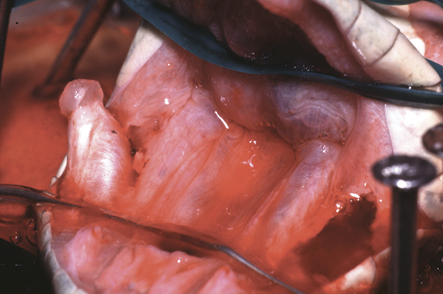 It remains attached to the fang anteriorly and this connection needs to be severed before the gland can be removed. As for other operations, this snake "recovered" without incident. Note: large Tiger Snakes like this and Death Adders have been given silicone implants to ensure that the head shape remains the same (see later paper for full details). Snakes without such implants appear to regain original thickness over time (several months). The snake shown here was mated in early and mid 2005 and became gravid, becoming one of the first venomoid snakes to have bred in Australia. 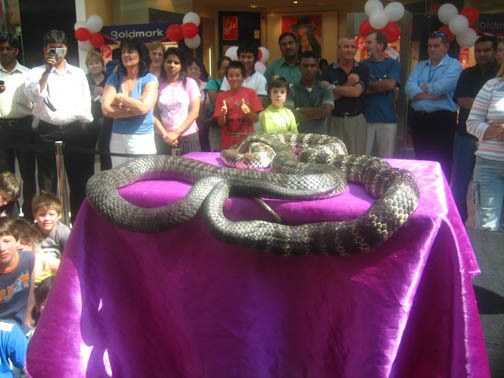 Below the same snake (on the left) as seen about two years after the operation and still mating like there was no tomorrow, and in a major shopping mall in full public view ... yes there was a complaint by a wowser of a "pornographic show". Back to the original venomoid surgery paper. More photos of venomoid snakes - post surgery.